Locations: Randomly changes every 24 hours. Each hunt in the current location of the Relic Hunter Mouse, both through sounding the Hunter's Horn and the hourly trapcheck, has the potential to attract the Relic Hunter Mouse in addition to whatever mouse is attracted by the Hunter's Cheese. The outcome of the main hunt (catch or failure to catch) has no impact on the outcome of the bonus hunt. Encountering a Relic Hunter Mouse will not affect progress in any area when encountered. The attraction of the Relic Hunter Mouse is not affected by Cheese or Charms. A successful catch of the Relic Hunter Mouse will occur as a bonus hunt that does not consume either Cheese or Charms. Hunters must have at least one Ancient Relic in their inventory for the Relic Hunter Mouse to be attracted. Catching a Relic Hunter Mouse will cause an Ancient Relic to be removed from the Hunter's inventory and a Relic Hunter Scroll Case to drop as loot. If a Hunter has 20 or more Relic Hunter Scroll Cases in their inventory, the Relic Hunter Mouse will no longer drop one as loot and will not remove an Ancient Relic from the Hunter's inventory. The cap on scroll cases allows hunters to pursue the Relic Hunter without consuming Ancient Relics. I caught an elusive Relic Hunter Mouse in [Location]! The mouse stole an Ancient Relic while it was in my trap, but dropped a Relic Hunter Scroll Case while scampering off! I can go to my Special inventory to open it. Make sure to tell your friends to check [Location] during the next [hours, minutes, seconds] to catch one! I caught an elusive Relic Hunter Mouse in the [Location]! I already have the maximum allowed Relic Hunter Scroll Cases, so the mouse left my supply of Ancient Relics alone and scampered off. Luckily she was not interested in my cheese or charms! I should tell my friends to check the [Location] during the next [hours, minutes, seconds] to catch one! Aw! I failed to catch an elusive Relic Hunter Mouse! All power types are of normal effectiveness against the Relic Hunter Mouse. Every 24 hours the Relic Hunter Mouse randomly moves to one of the following locations. Viewing the Treasure Map popup under the Invites and Scroll Cases tab offers a hint to the Relic Hunter's current location. The Relic Hunter Mouse appears in the Living Garden and Twisted Garden at the same time. Hiding within the hustle and bustle in the city of the crown. In a town with a dense population. Trying to spot the King himself. By an agricultural structure once owned by one of Gnawnia's most prosperous farmers. Grinding up hundreds of tiny seeds from a stalky, golden plant. Observing the churning and grinding of the new harvest. By the sea where there's plenty of fresh air and sunshine. Near the loud and low horns and the dinging of bells. Visiting where many new hunters seek out seafaring mice. Cutting through the pass to reach the town on the other side. Looking across vast landscapes and the many horizons of the land. In a treacherous environment where only the toughest of mice survive. Browsing wares available with a most royal currency. Under a circular roof atop arm-shared paths. Where royal strength rewards hunting prowess. Amongst the triumphant trumpets of master hunters of old. Browsing the rewards of competitive champions. Competing for the limelight amongst the finest champions. Atop a tall tower with the perfect view of an Eclipse. Climbing up spiralling, menacing stairs. Trekking up a massive tower in Valour. By a peaceful rock in a grassy clearing. Taking a relaxing hike through a forested area. Tucked behind dense trees where it's quiet and peaceful. By a tree older than Gnawnia itself. Finding shade in the largest tree in the Kingdom. Tracing the deep patterns of bark growing on ancient towers. Climbing jagged rocks and slick moss. Waist-deep in a shallow, sparkling pond. Performing bizarre experiments and chemical reactions. Where the powerful and strange breeds of mice first arose. Amongst powerful drills and excavation equipment. Exploring the deep and winding caverns near a technologically-advanced underground city. Hiding in the shadows while standing in the limelight. Investigating the spirits of slain mice. Studying the spooky remains of Zombie Mice. Surveying where scientists harvest 'spare parts'. Ducking between stalls and tents and loud merchants. Searching for the best deals in the Burroughs. Under the pointiest tent in all the Kingdom! Relaxing in the shade of tall engraved rock. Standing among the ranks of new students out in the field. Watching the careful training of artful students. Carefully watching the training activities of advanced students. Practicing an ancient art with fledgling warriors. Safely inside the bottom floor of a bamboo building. Listening for sinister secrets deep underground. Walking through dark hallways in search of a Keeper's Candle. Trapped between two planes of existence. Inside an elaborate one-way trap designed by Plankrun. Outside a smoky purple tower. Standing on the other side of a green and purple portal. On a small bit of land near a volcano. Watching the peaceful gathering of tribal mice. Near the bluE waters of the island. Watching the calm waters of Rodentia while remaining safely ashore. Investigating a well-seasoned Gumbo Cheese. Running through flat fields of greeN. Ankle deep in rocky, tropical sand. Tumbling down hills of rreD sand. Lurking in a damp and darkened grotto. Roaming amongst the most powerful of Lich mice. Keeping an eye on the long-arm of the law. Spitting in a spittoon! Yuck! Sipping delicious liquid cheese from a river. Enjoying a quick dip in a cheesy bath. Protecting her ears from the sound of loud pumps. Testing out balance on the high seas. At the beachside site of an invasion force! Shivering near the edges of the mainland. Walking along the coldest waters in Gnawnia. Watching the sky and wondering what the weather will bring. Expanding knowledge and climbing endless ladders. Leafing through ancient tomes of knowledge. Walking along the bottom of the Rodentia Ocean. Dodging arrows, spears, swords, and spells! Marching through the Sandtail Desert. Visiting a walled city that is no stranger to sieges. Enjoying a drink on the overgrown rooftop patio. Tending to a most troublesome and dangerous garden. Carefully navigating a subterranean and humid environment. Climbing and exploring some long lost ruins. Up high upon a weather changing plateau. 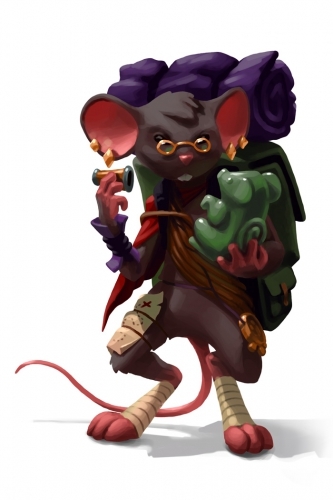 29 August 2012: The Relic Hunter Mouse is released in the Muridae Market. Its location changed on a predictable weekly basis. 6 May 2013: The daily location of Relic Hunter Mouse mouse begins to change randomly. 28 April 2013: Catching the Relic Hunter Mouse in the Seasonal Garden begins giving hunters 1% increase in their Tower Amplifier. 23 June 2015: The Relic Hunter Mouse stopped dropping Treasure Map Scroll Cases and Living Garden Scroll Cases and began dropping Relic Hunter Scroll Cases as part of Season 3 of treasure hunting. This mouse is so dedicated to the study of Ancient Relics that they'll never approach your trap until you have at least one, and will approach more often if you have more. Further, the Relic Hunter Mouse will only be searching in one location at a time, so you'll have to search if you expect to find any! This page was last edited on 21 March 2019, at 06:23.